The world’s most powerful woman will start coming into her own next weekend. Stocky and forceful at 63, this former leader of the resistance to a take her place as the President of Brazil. 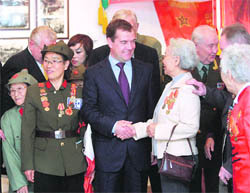 Russian President Dmitry Medvedev, who is set to meet his Chinese counterpart Hu Jintao tomorrow, is expected to emphasise on the cooperation between the two nations in blocs like RIC and BRIC, which also involve India, among other bilateral and global issues. There is good news for those who feel uncomfortable in socialising, as scientists have developed a new nasal spray which they claim can help overcome shyness.A team of scientists found that oxytocin, the brain hormone known for increasing empathy and bonding, improves the social skills of the shy when used as a nasal spray. Nepal is in a mess. Some 20,000 armed Maoists live in camps, waiting to be absorbed by the Army. The Parliament failed to finalise the Constitution. The economy is in poor shape. And India, the big brother, is getting blamed for it all. What's wrong ? ASHOK TUTEJA seeks some answers. Nepal's Constituent Assembly failed for the eighth time , during the past four months, to elect a new Prime Minister on Sunday. The deadlock continues , partly because other mainstream parties do not trust the single, largest party, Unified Communist Party of Nepal ( Maoist), because it continues to put its faith in one-party rule and continues to threaten it would resume armed struggle. BISHNU BUDHATHOKI traces the factors behind the impasse. Political instability is not new to Nepal. Nor is anti-Indianism. Nor is the penchant for just about any Government in Kathmandu to play the China card.So is it plus ca change, plus c'est la meme chose? What is new is the completely transformed historical context in which the political theatre is being played out. The stakes are higher than they have been before. The implications are totally unpredictable. There appears to be no end to the political uncertainty in Nepal as RC Poudyal of the Nepali Congress failed to get majority support in Parliament in the primeministerial election for the eighth time in a row on Sunday even after Maoist chairman Prachanda withdrew from the race. A huge cache of sophisticated arms and ammunition, which was seized six years ago in Bangladesh, was procured from a Chinese state-run arms factory for India’s northeastern separatist organisation ULFA, a media report claimed today. As head of state, President Dilma Rousseff would outrank Angela Merkel, Germany’s Chancellor, and Hillary Clinton, US Secretary of State: her enormous country of 200 million people is revelling in its new oil wealth. Brazil’s growth rate, rivalling China’s, is one that Europe and Washington can only envy. Her widely predicted victory in next Sunday’s presidential poll will be greeted with delight by millions. It marks the final demolition of the “national security state”, an arrangement that conservative governments in the US and Europe once regarded as their best artifice for limiting democracy and reform. It maintained a rotten status quo that kept a vast majority in poverty in Latin America while favouring their rich friends. Rousseff, the daughter of a Bulgarian immigrant to Brazil and his schoolteacher wife, has benefited from being, in effect, the prime minister of the immensely popular President Luiz Inacio Lula da Silva, the former union leader. But, with a record of determination and success (which includes appearing to have conquered lymphatic cancer), this wife, mother and grandmother will be her own woman. The polls say she has built up an unassailable lead, of more than 50 per cent compared with less than 30 per cent, over her nearest rival, an uninspiring man of the centre called Jose Serra. Few doubt that she will be installed in the Alvorada presidential palace in Brasilia in January. Like President Jose Mujica of Uruguay, Brazil’s neighbour, Rousseff is unashamed of a past as an urban guerrilla, which included battling the generals and spending time in jail as a political prisoner. As a little girl growing up in the provincial city of Belo Horizonte, she says she dreamed successively of becoming a ballerina, a firefighter and a trapeze artist. The nuns at her school took her class to the city’s poor area to show them the vast gaps between the middle-class minority and the vast majority of the poor. She remembers that when a young beggar with sad eyes came to her family’s door she tore a currency note in half to share with him, not knowing that half a banknote had no value. Her father, Pedro, died when she was 14, but by then he had introduced her to the novels of Zola and Dostoevski. After that, she and her siblings had to work hard with their mother to make ends meet. By 16 she was in POLOP (Workers’ Politics), a group outside the traditional Brazilian Communist Party that sought to bring socialism to those who knew little about it. The generals seized power in 1964 and decreed a reign of terror to defend what they called “national security”. She joined secretive radical groups that saw nothing wrong with taking up arms against an illegitimate military regime. Besides cosseting the rich and crushing trade unions and the underclass, the generals censored the press, forbidding editors from leaving gaps in newspapers to show where news had been suppressed. Rousseff is likely to invite President Mujica of Uruguay to her inauguration in the New Year. President Evo Morales of Bolivia, President Hugo Chavez of Venezuela and President Fernando Lugo of Paraguay, other successful South American leaders who have, like her, weathered merciless campaigns of denigration in the Western media, are also sure to be there. "It is expected that special attention will be paid to the prospects of interaction in the formats of G-20, Shanghai Cooperation Organisation, Brazil-Russia-India-China (BRIC) and Russia-India-China (RIC)," the Kremlin said ahead of tomorrow's summit in Beijing. Prior to Medvedev's China visit, scholars from Russia, India and China at their 10th trilateral conference here felt that an important key to progress of RIC is its 'no confrontation' character. "A tripartite partnership is not an alliance and not directed against any other country, pursuing the basic objective of strengthening international peace, development and prosperity of each of the three countries. But the 'love hormone' has little effect on those who are naturally confident, they said, stressing that their findings could have implications for those with severe social deficiencies, often apparent in conditions like autism. "Oxytocin is widely believed to make all people more empathetic and understanding of others," said lead researcher Jennifer Bartz, a professor at the Mount Sinai School of Medicine of NY University. "Our study contradicts that. Instead, oxytocin appears to be helpful only for those who are less socially proficient, Prof Bartz was quoted as saying by the Daily Mail. It's a classic case of falling between two stools. New Delhi does not want to be seen to be meddling in Nepal's affairs, yet in the eyes of the man on the street in Kathmandu, it is precisely doing that. Even as the Himalayan nation is slipping into a political quagmire of its own making, the blame is being laid at India's doorstep. It was in early August that Prime Minister Manmohan Singh sent Shyam Saran, a former Indian envoy to Kathmandu, as his special envoy to the neighbouring country to mediate among the warring factions in the prolonged and bitter race for the Prime Ministership. One of the most articulate Indian diplomats, Saran might have been welcomed in Kathmandu had he been on a private visit. But the cap of an Indian emissary that he donned raised the hackles of all political parties. The visit was projected in the Nepalese media as manifestation of India's blatant interference in Nepal's internal affairs. The Nepalese Foreign Ministry was constrained to issue a statement saying Saran's visit was a private affair and thereby indicating that the Nepal Government had no knowledge about it. Just around the same time, an intelligence official posted there is believed to have called up a member of Nepal's Constituent Assembly and threatened to have his daughter's provisional admission in the embassy-run Kendriya Vidyalaya cancelled if he did not vote in a particular manner in the election for the Prime Minister's post. Was the intelligence operative acting on his own or at the instructions of New Delhi? Nobody knows. Perhaps the left hand does not know what the right is doing. India's policy on Nepal is in a disarray. Mandarins at the South Block seem to be groping in the dark on how to pursue New Delhi's agenda in its tiny neighbourhood, where anti-India feeling is rising by the day. On the one hand, Nepalese do recognise that India has played, can play and should play a positive role in the nascent peace process while on the other hand, there is all around unhappiness over how New Delhi is seen to be playing this role. Indian officials also admit that the peace process in Nepal is extremely complicated. To be fair to New Delhi, it did play a constructive role in helping democracy take roots in Nepal and bring about a rapprochement between various groups there. But that was a different era. It is doubtful if India can help bring the peace process to the desired outcome, given the increasing influence of China in Nepal and the rising anti-India sentiments. A senior PMO official vehemently denies the charge that India is interfering in the internal affairs of Nepal. ''Believe it or not, everyone in Nepal wants us to get involved…we try to act as an honest broker, yet we are being projected as villain of the peace process,'' he rues. 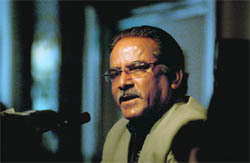 He also refutes the allegation that India tried to prevent Maoist leader Pushpa Kumar Dahal 'Prachanda', an outspoken critic of India, from becoming the Prime Minister. But New Delhi is quite relieved that the Maoist cadres have not gone back to the jungles despite the current state of uncertainty. The situation would certainly have been worse had the Maoists again taken to arms. India has long enjoyed strong influence over its landlocked neighbour. Virtually all Nepal's imports and exports must transit through India, which is also a major donor to the impoverished Himalayan nation. The imbalance in trade is another source of resentment in Nepal and makes it a fertile ground for sowing seeds of suspicion about Indian meddling in its internal affairs. And to thwart any attempt at Indian hegemony, successive administrations in Nepal have cleverly played the 'China card'. In recent years, China has sought to increase its influence in the Himalayan nation by investing in roads and infrastructure projects. Beijing's moves are also seen to be in line with its policy of 'string of pearls' around India. Recent years have seen a flurry of visits by Chinese political and military figures to Kathmandu to bolster ties, much to the anxiety of the Indian policy makers and strategic experts. On top of all this, Nepal has become a safe haven for anti-India elements, particularly Pakistan's notorious spy agency ISI. It is common knowledge that the ISI is using the Nepalese territory to flood India with fake Indian currency notes, illegal arms and drugs. There have been reports suggesting that the territory of Nepal is also being used by anti-India forces to infiltrate trained 'jehadis' into the Indian territory. After all, it is quite easy for them to cross into India from Nepal, given the fact that the 1850-KM long Indo-Nepal border is open and no visa is required for traveling between the two nations. India has repeatedly conveyed its concerns over the issue to the authorities in Kathmandu but they have done little to address them. Nepal is in the throes of a revolutionary change. It will be a while before things settle down. The transition to a democratic republic may turn out to be a long one and full of surprises too. Until the new Constitution is finalised, political turmoil will continue. What are the options before India in the given political mess in Nepal? India has genuine economic and security interests in its neighbourhood. In its dealing with a new and emerging Nepal, New Delhi would have to be patient. More importantly, it will have to contend with new forces and new uncertainties. Old policies may have outlived their utility. For far too long, India has been focused on the politics of the peace process in Nepal. It is necessary for New Delhi to realise the limits of influencing the course of the political process there. Instead India might benefit by refocusing its attention on long-term economic relations and in building human resource capacities in Nepal to win the hearts and minds of the Nepali people. Political leaders in Nepal, despite their differences, appear to be quite responsive to India's overtures in the economic arena. It will only be in the overall strategic interest of India if it is seen as helping Nepal in economic activities rather than using its resources and clout for serving its political interests. How did the present crisis start ? The last 20 years have seen Nepal move from a Hindu kingdom to a democratic and secular republic. The 239 year old monarchy was cast aside in 2006 and people voted for a constituent assembly and an interim government in 2008. Maoists emerged as the largest single party but fell short of a majority. Why are the parties divided ? Unified CPN ( Maoist) continues to say it has no faith in parliamentary democracy, believes in one-party rule and insists on absorbing its underground militia into the Nepalese Army. It also tried to take arbitrary decisions and sought the removal of the President and the Army Chief. Other parties are not sure it would change its spots. What is the nature of the crisis ? a) The constituent assembly has failed to finalise the constitution by May 28 as mandated. The assembly extended its own life by one year to complete the task. But differences persist. b) In the absence of a consensus between parties, there is a caretaker government with few powers. 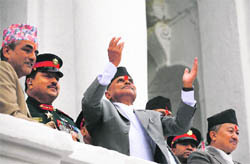 c) Having failed to sack the then Army Chief over the integration of the armed Maoist guerillas officially numbering around 20,000, Prachanda resigned as PM and Maoists pulled out of the government in 2009 and then forced the next government headed by Madhav Kumar Nepal of UML to quit. The repeated failure of Nepal's political parties and Maoists to elect a new Prime Minister are symptomatic of a deep malaise which seems to make consensus-based politics even in the short run a near-impossible proposition. This is not just a destructive pursuit of personal or party power to the neglect of the greater common good: this is about control of the security sector. The Maoists have no inclination to give up either their ideological objective of a one party state or the use of violence to achieve it; the political parties cannot take the risk of letting the Maoists back again into the power structure with their army and arms in tact. There is no trust between them to underpin any sustainable peace process. The anti-Indianism, traditionally equated with nationalism in Nepal, is no longer just a reflection of the psyche of the Valley elite, a manifestation of political insecurity on the part of one or other political group which wishes to attract India's support for its political ambitions. It is widespread, deep and solid, covering the political spectrum, civil society elite, media and business. India's motives, style and judgment are freely criticised. Today India seems to be without a dependable, friendly constituency in Nepal. Nepal is in a mess which is largely of its own making; India must not contribute to it. Sensitive and subtle diplomacy over the long haul is what is needed, to save the prospects for peace in Nepal and restore the India-Nepal relationship to its former resilience. There is a section of the Maoists which wants to go back to the 'people's war'. However, the majority of the leadership, and even the cadre, does not approve of this line. It was in fact their realisation way back in 2002-2003 that they can not capture the state and hold it through violence (peoples' war) that brought them to seek peaceful struggle and join the democratic mainstream. They justified it ideologically as a tactical move, but in the hearts of their hearts they knew that there was no other option. The persisitng crisis in Nepal may of course drive them to agitation through other means, like street protests and urban resistance, but not with guns. China's economic rise provides China with confidence and resources to create and nurse its expanded strategic space at India's cost. There is also the obvious Tibet factor to prompt China to keep a watch in the developments in Nepal. China, in the past, has worked mostly through the established governments in Kathmandu, and the King was a great ally of China. It has now taken to a more active engagement at the political level through political parties. It must however be understood that there are severe cultural and geographical constraints on China's role in Nepal and it is mostly India's failures to keep Nepal on its side that give space to Chinese activities. Indian diplomacy is often insensitive to Nepali aspirations and expectations. India even fails to assess political situation properly in Nepal at times (recall the assessment that Maoists will not show good results in 2008 Constituent Assembly elections). China surely takes advantage of it. Every political party and political force (like the King) has used the China card against India to extract favours, concessions and support. To portray only Maoists as being Chinese allies in Nepal is gross distortion of reality. In fact the Maoists were prepared to work with India, as they know they have to, but we quite foolishly alienated them. Prospects of Nepal-India relations would depend upon what we do in Nepal. If we gear our policies to the larger interest of Nepalis and work through representative forces, even if that happens to be Maoists, the bilateral relations will grow. But if we work through pliant leaders and ignore broader Nepali expectations, or hurt their sensitivities by unduly interfering in their day to day affairs, India will spoil its relations with Nepal. Bilateral relations between Nepal and China are poised to acquire more depth and stability in the coming years. 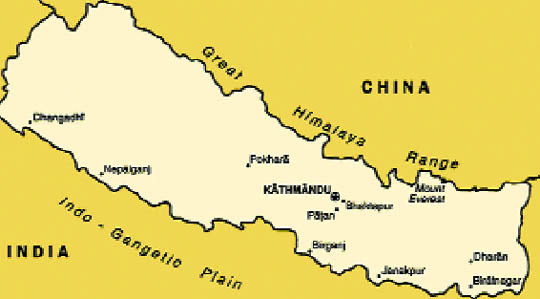 For, unlike China's inability to influence Kathmandu during the late 1980s, today a cash-rich rising China is providing alternative incentives to land-locked Nepal, away from the latter's treaty with New Delhi. Beijing is following a multi-pronged approach in Kathmandu that could well marginalise Indian role. China had stepped up its diplomatic and military contacts with Nepal as seen in more than 30 delegations visiting Nepal in the last couple of years. Secondly, apart from the plans to have a second Kodari road, in addition to the proposal to lay a railway line, Beijing had constructed a 125-km optical fibre network from Khasa in China to Kathmandu in 2008 which provides communication channels to Nepal with the outside world. Once a week bus service from Kathmandu to Lhasa from May 2005 to 2006 but resumed again in 2008 provides tourist inflow estimated at about 20,000 a year - about a quarter of Indian tourists to Nepal. The 4th Meeting of China and Nepal Tourist Committee held in September 2010 have plans to enhance tourist inflows from China. China is enhancing its trade to half-a-billion dollars this year as compared to $440 million in 2009. The 11th meeting of Nepal-China Non-Government Cooperation Forum in September 2010 - promised investments from 58 Chinese joint venture companies as compared to 27 from India. To influence policy, China has set up ten China Study Centres in Nepal. The Nepali peace process which was recently hailed by the UN as a model in post-conflict resolution has been stuck for more than a year due to irreconcilable trust deficit between the Maoist and non-Maoist political parties. The festival season is approaching and Nepal will soon stop working for a month for Dussehra and Tihar. It is time for divine intervention to forge a political consensus to get on with the peace process. India has been at the heart of every major change in Nepal's recent history - the grand reconciliation in 1950, shortlived experiment with multi-party democracy in 1959; restoration of democracy in 1990 and the landmark peace agreement between the Maoists and the seven party alliance in 2005. Ahead of the voting in the 601-member Constituent Assembly, the House officially approved the withdrawal of Prachanda’s candidacy, leaving Nepali Congress (NC) candidate Poudyal alone in the fray. Poudyal received 116 votes in his favour, 184 votes short of a simple majority. Seventy-one lawmakers stayed neutral, while the remaining members did not participate in the voting process, the nepalnews online said. Unified CPN (Maoist) and CPN-UML lawmakers did not participate in voting. Till the seventh round of elections, CPN-UML had participated in the voting process and stayed neutral, the report said. The next round of voting will be on September 30. Following his failure to get majority support in Parliament seven times in a row, the Maoist chief on September 17 withdrew from the prime ministerial poll after a deal with the CPN-UML in bid to facilitate the formation of a national consensus government. Nearly three months after the 22-party coalition led by Prime Minister Madhav Kumar Nepal collapsed, eight rounds of poll have failed to elect a new leader. Now, Nepal is back to the bleak scenario it faced almost three months ago when the Maoists forced the prime minister to quit. The politics of consensus, essential for drafting a new constitution by next year, has remained deadlocked since 2008, when the parties lost their common enemy, deposed king Gyanendra, who had united them unwittingly by trying to grab power. With monarchy now abolished and lacking an enemy to blame for their shortcomings, Nepal’s parties are back to their old squabbling for power that in the past led to a Maoist insurrection followed by a royal coup. The report also said that some officials of the National Security Intelligence (NSI) and Directorate General of Forces Intelligence (DGFI) made the arrangement to collect the 10-truck arms consignment from China. The arms were procured from the Chinese state-run arms factory North Industries Corporation (NORINCO) for India’s northeastern separatist organisation ULFA, according to a report published in a Bengali newspaper ‘Prothom Alo’. These were disclosed in the probe of the CID, the report said, adding the investigation was carried out at the directives of the court and on the basis of seven observations. The CID submitted the report on latest development of the probe to the court of the Chittagong Metropolitan Sessions Judge on September 15. The CID also applied to extend the time of the investigation and hearing to this end could be held today. In this regard, the daily contacted with the Chinese embassy in Dhaka yesterday evening but they did not give any statement, the report said. Meanwhile, former state minister for home of the BNP-Jamaat alliance government Lutfozzaman Babar, who is now in jail in other cases, and former home secretary Omar Faruq may be implicated in the 10-truck case. Besides, other NSI and DGFI high officials, who were arrested and grilled earlier, may be accused in the sensational case, the report said. A Chittagong court on September 20 took the statement of former deputy inspector general of the Criminal Investigation Department Farrukh Ahmed in the sensational 10-truck arms haul case. Chittagong metropolitan magistrate Mahabubur Rahman took his statement because Ahmed was on the five-member committee, formed by the then government to investigate the 10-truck arms on April 1, 2004. His statement was taken to establish whether or not the committee’s report was ‘influenced’, Maniruzzaman Chowdhury, investigation officer said. The CID had earlier quizzed Ahmed. Earlier on September 16, another Chittagong court recorded statement of former National Security Intelligence (NSI) director Enamur Rahman Chowdhury in the same case. Maniruzzaman, senior assistant superintendent of the Criminal Investigation Department, had said: “His statement is very important as he was a member of the investigation team formed by the (BNP) government.” But he gave no hint of what the former NSI official had said. Enamur Rahman Chowdhury was questioned by the Criminal Investigation Department on Nov 11 last year.